A few of the brands that we carry! With 4000+ products and 170+ brands MedicalProductsDirect.com is your "GOTO" place to get medical related equipment, supplies, furniture and much more. 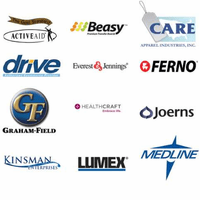 Here is just a partial list of some of the brands that we carry. We have you covered from A to Z.